Diesel has been named as one of the first brands that will roll out a major retail branding campaign on Sony PlayStation's long-awaited home – with gamers able to buy virtual clothing for their avatars. The clothing – which will range from free to £1.30 will be available to buy and clothe the virtual representations of people in the Home virtual world – which will serve as the user interface for PS3. Home is launching into open beta, and Diesel, with a campaign developed by Mindshare, are one of the first of a number of companies that are looking to establish an early presence. "PlayStation Home not only offers Diesel the chance to engage with its target audience in a new way but more importantly demonstrates how media can close the loop moving from a communication to a distribution channel - in many ways a new high-water mark for retail brands," Mindshare partner Ben Lukawski told NMA. The concept of Home is to create a Second Life-like virtual world where people create avatars that will alow them to socially interact, find like-minded gamers for multiplayer games and show off their 'trophies' or achievements from their games. 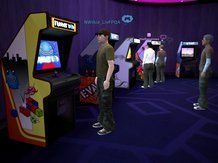 "PlayStation Home is unique to anything else in the gaming world and by partnering with both global and regional gaming and non gaming brands; we are able to offer exciting and entertaining content that will enhance the PlayStation experience," said Sony Computer Entertainment Europe's Daniel Hill.